Want to join the most fun team in town? 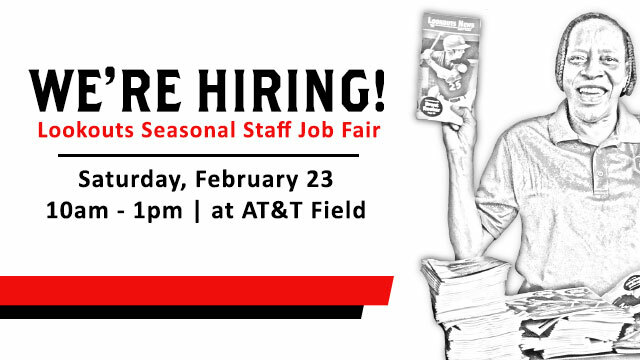 On Saturday, February 23, the Chattanooga Lookouts will be hosting their annual job fair at AT&T Field from 10:00 a.m. to 1:00 p.m. Last year, the team hired over 100 game day employees at this event. Prospective employees, 16 years of age or older, will be able to interview for one of the many positions that are available. All potential employees will be asked to fill out an application and will be subject to a background check. Individuals are encouraged to fill out the team's online application on Lookouts.com and bring it with them to the event. For more information about the job fair or the application process call the Lookouts front office at 423-267-2208.